At an official event celebrating the closing of the first cohort of the Sustainability Leadership and Innovation Pro-gram, effective resource management projects were presented in the Non-Alcoholic Beverages and Soft Drinks sector. 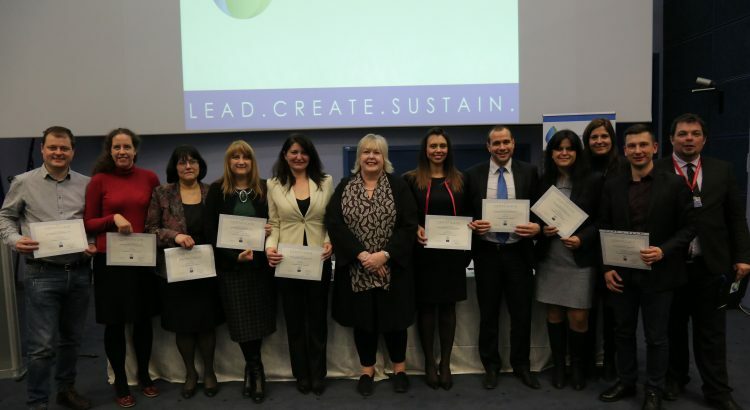 The program was launched for the first time in Bulgaria in March 2018, providing industry professionals with the opportunity to acquire knowledge on sustainable business development. It was developed jointly by the Bulgarian Soft Drinks Association (BSDA) and the American University in Bulgaria (AUBG) with the assistance of distinguished international professors. The event was attended by representatives of the business, state administration and edu-cational institutions in the country. The closing conference took place yesterday at 19:00 pm at the AUBG Elieff Center for education and culture. Special guest at the ceremony was President Rosen Plevneliev (mandate 2012 – 2017), ambassador of the American University in Bulgaria. “Sustainable development is a magic word. It’s a word that touches us because it has a real impact in every aspect of our life. We live in a time when we can not afford to be indifferent. Responsible leadership is the skill we need to contribute to the future development of Bulgaria and to build a network of active and alert young people to work towards the creation of a sustainability culture. This includes both sustainable resource management and environmental protection, as well as the pursuit of education and knowledge on the topic”, Mr. Rosen Plevneliev said at the ceremony. This year’s edition of the program involved 16 professionals from different business and administration sectors. The training was conducted entirely in English aimed at providing latest information and knowledge on sustainable development, corporate social innovations and leadership. The ambition of the organizers is to continue the training this year, further enhancing its content and scope. “The interest in the first training course proves the importance of the program and the idea that stands behind it. Our mission is to contribute to the development of leaders of change who will work for the sustainable future of Bulgaria. We are pleased to find followers and we would like to congratulate all the participants for their motivation during the training and preparation of their individual projects”, Jana Velichkova from the Bulgarian Soft Drinks Association said. “We are focused on delivering quality education, namely, education that forms a way of thinking and gives direction for development. We are glad that we have implemented this program jointly with the business, as it is entirely tar-geted at creating added value, undertaking specific actions and achieving long-term results. For us this is a dream come true. I am proud that we have been able to be part of this project, which is aimed at achieving change not only in Bulgaria, but also at contributing to the sustainable development of the entire region“- Dr. Emilia Zankina, Provost of the American University in Bulgaria, explained. The projects of the participants presented at the event were devoted to the efficient management of resources; strategic planning for sustainable development; building a network of partners; sharing best practices and examples in the sector; waste recycling and re-use in the production process. Each participant had to identify leadership in a specific area of sustainability and innovation challenges, as well as to work on an individual project. The training modules also included practical exercises and teamwork, providing a theoretical framework and free access to additional sources of information. The Sustainability Leadership and Innovation Program was created within the Crystal Clear Initiative launched in April 2017 by 8 companies – members of the Bulgarian Soft Drinks Association. Its aim was to introduce rules and controls to enforce compliance with the highest quality standards in the sector and the development of a clean, responsible and transparent business environment – both in the bottling industry and the Bulgarian economy. The BSDA represents over 70% of the soft drinks industry, including bottled waters. The members of BSDA are well-established, socially responsible companies, which follow the highest international quality standards, being committed to the long-term economic and social development in the countries where they operate in. Established in 1996, BSDA is a long-standing member of the European Federation of Bottled Water (EFBW), the European Soft Drinks Industry (UNESDA) and is also a member of the European Fruit Juice Association (AIJN). The American University in Bulgaria (AUBG) offers high quality American education and is proud of the success of its graduates all over the world. The university holds 99.8% of the graduate students who start work or continue their MBA or doctoral degree programs after graduation. The AUBG is committed to supporting lifelong and executive education and understands that leadership unlocks the human potential necessary for economic success and social inclusion. The university embraces its role in supporting sustainable development through excellence in education.